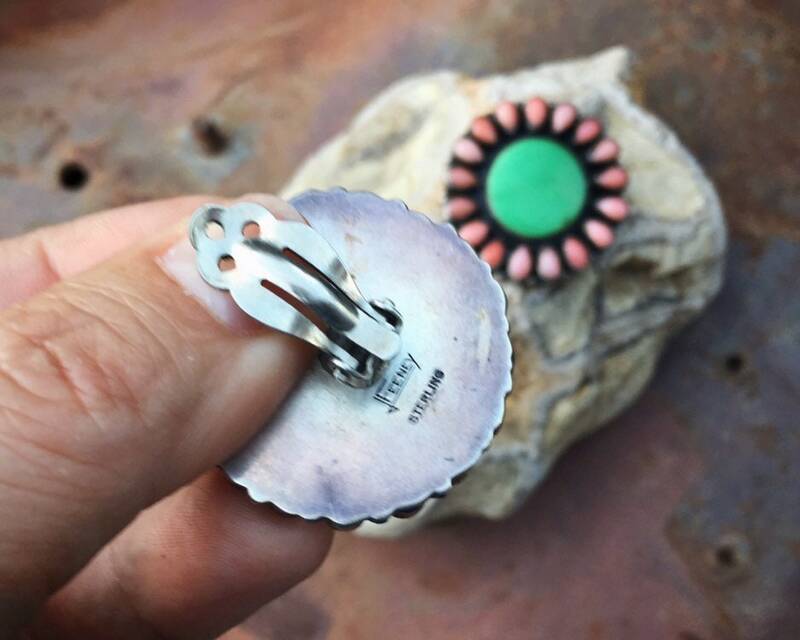 Leo Feeney is one of my all-time favorite jewelry designers, period, and especially among those specializing in Southwestern jewelry. I'll talk more about him in a moment, but these earrings are beyond stunning. They are clip-ons, and they are early Feeney. 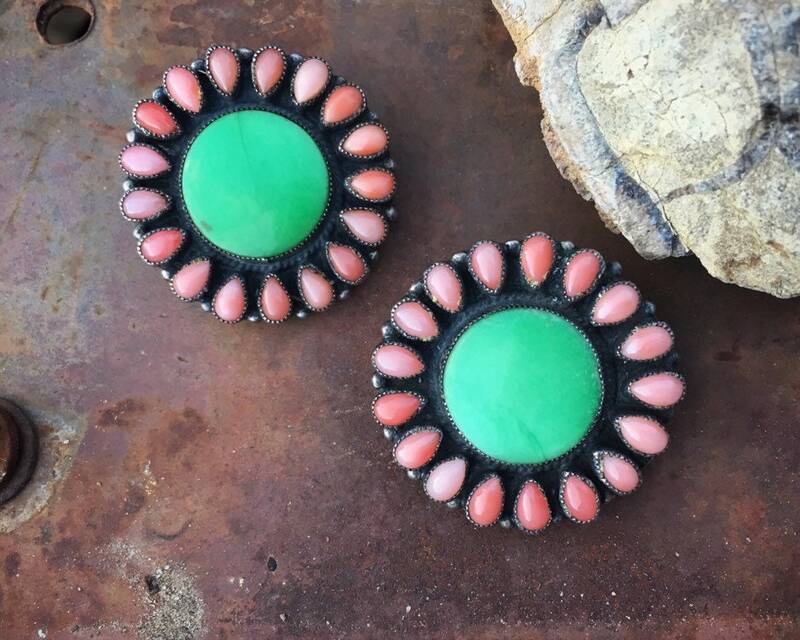 The green stone in these is that kind of elusive color and opaqueness that makes you wonder, Is this apple jade, chrysoprase, or something else? 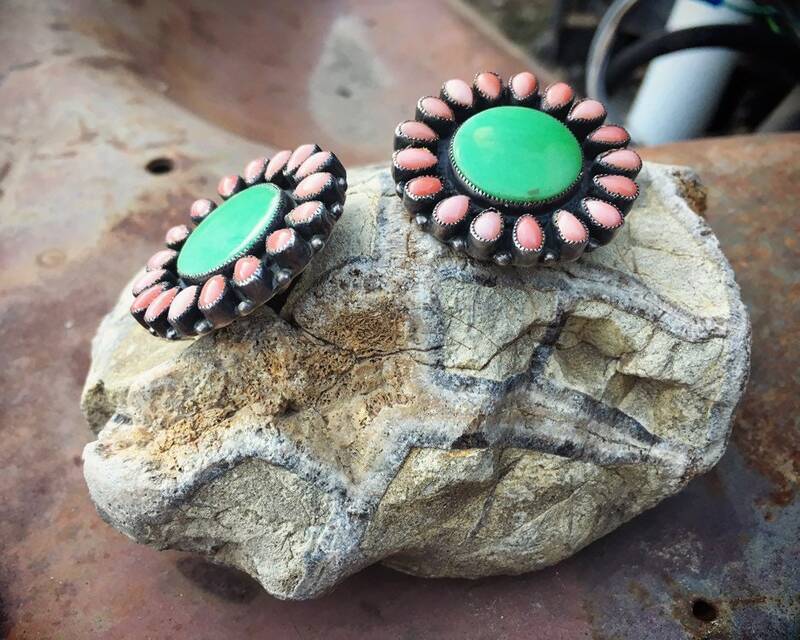 The hallmark of most any Feeney piece is the use of multiple gemstones in gorgeous cluster designs, and after researching many of his vintage pieces, I have come to the educated guess that the green in these earrings is actually Carico Lake turquoise. 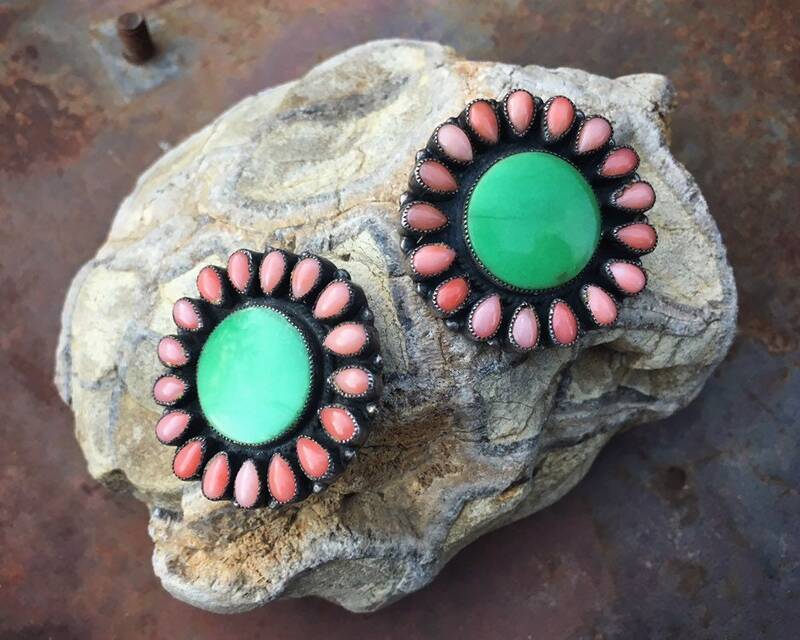 This rare turquoise from Nevada was one of his favorite stones to use in jewelry making. 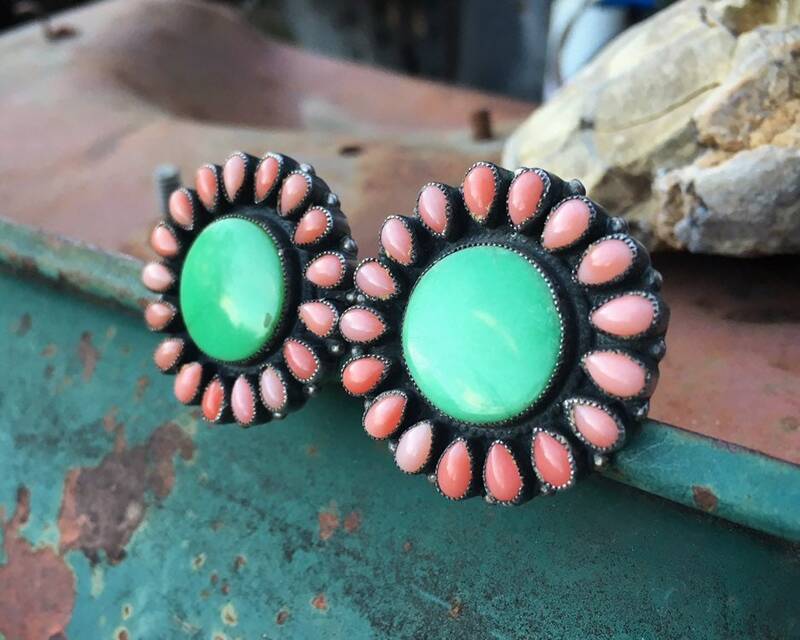 Feeney began making jewelry in the early 1970s, and he was especially inspired by Zuni designs. 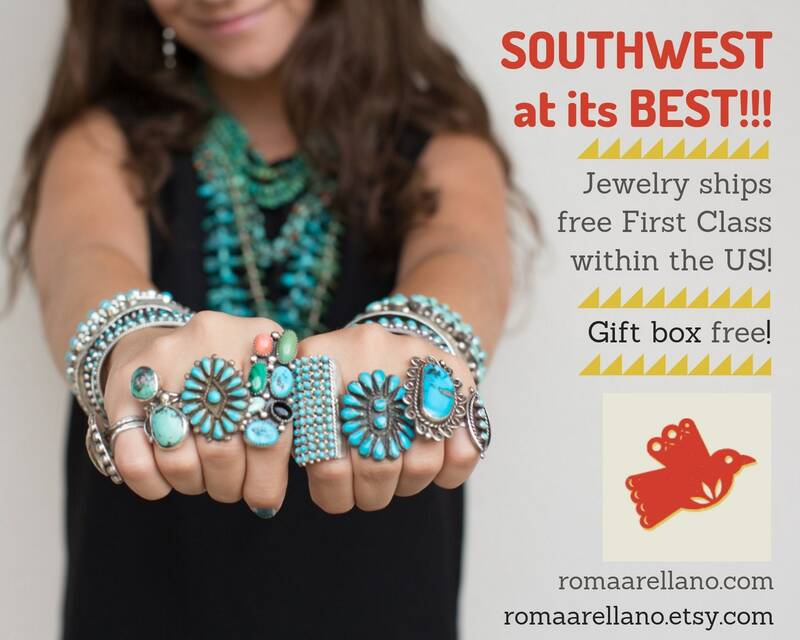 Zuni are known for their various cluster styles. Some more contemporary artists, Native and non (Feeney is not Native American) often today use smooth bezels in cluster jewelry. Smooth bezels are easier than sawtooth. 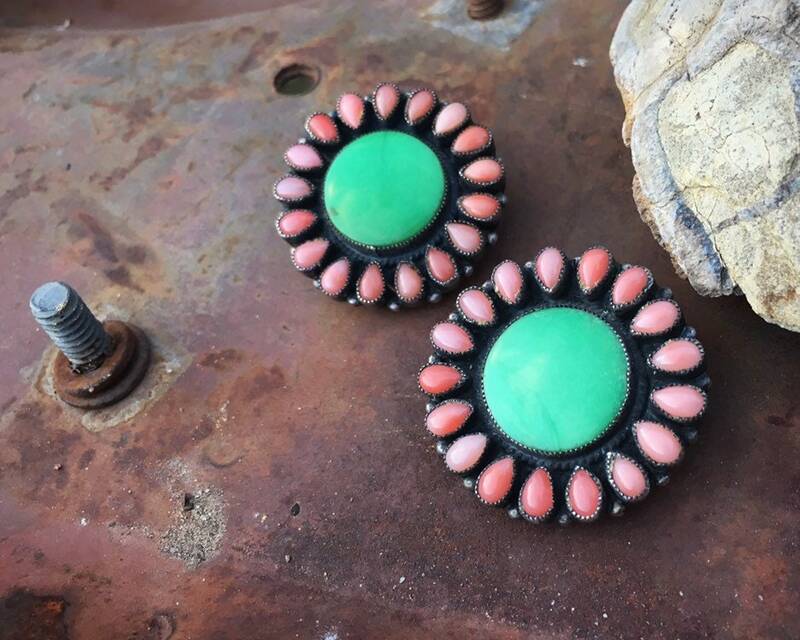 But old Zuni jewelry, and these Feeney earrings, have beautifully rendered sawtooth bezels. The tooth on the sawtooth is fine and precise, characteristic of Feeney craftsmanship. Also, the combination created by the pink coral--shades ranging from light to deeper--combined with that apple green color. Did I say stunning? Photos do not do these earrings justice. Large earrings by Feeney can easily surpass $1,000. And so to make an investment in Feeney clip-ons, well, that can be tricky given how easy it is to lose clip-ons. So my idea is to have them converted to posts, which would be a fairly easy modification, and we can do that here for an additional $25. The post would fall at just about where the top of the clip lands. In fact, there is a small hold there that is the perfect spot for a post. If you want to convert them to ear wires, or possibly a ring and a brooch, or two matching rings...I will let you have that work done locally. I so honor the original work that my willingness to change it only goes so far as the most basic and minimal of modifications. 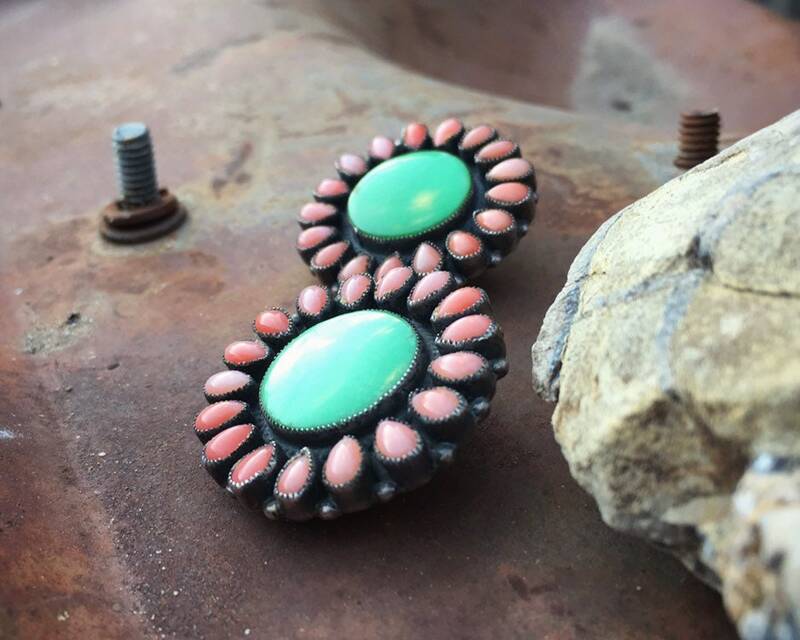 So if you do want to convert to posts, convo me before purchasing so that I can create a custom listing for that work to be purchased along with the earrings. 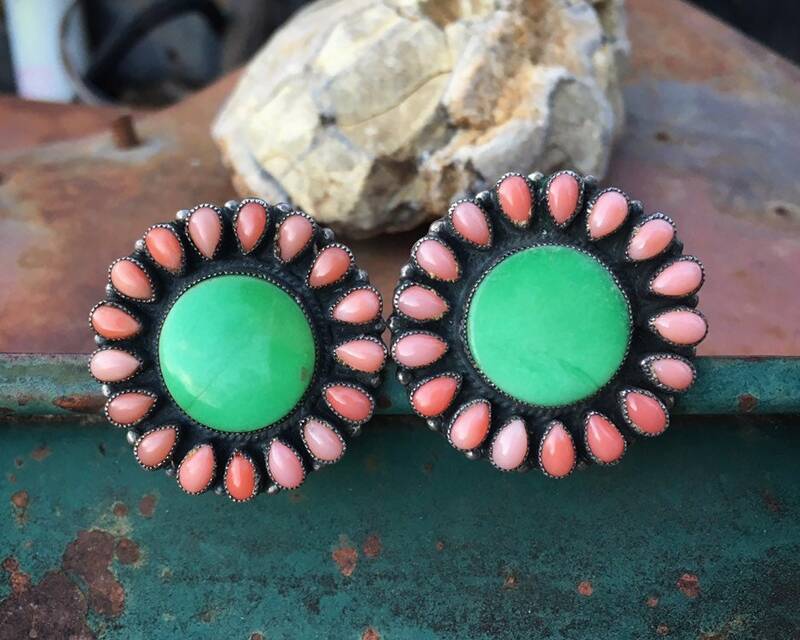 The earrings are about 1-3/8" in diameter. Some small scratches on the silver from age and wear, and the silver does have a bit of tarnish that I think is the perfect patina. The crevices between stones, by the way, is oxidized by design, and that dark color creates amazing depth. In very good vintage condition. Stunning artistry by a highly collectible artist.